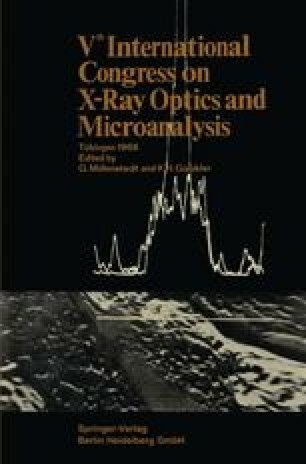 Electron probe microanalysis essentially involves a miniaturisation of the classical procedure of X-ray spectrometry, based upon the discovery by Moseley  that each element in the periodic table is characterised by a relatively simple X-ray spectrum. The basic experimental arrangement is outlined in Fig. 1. An electron beam (E) of moderate energy (5–40 kV) is directed on to the sample (S) to be investigated, in vacuo, and the X-rays (X) emitted from it (in all directions) are dispersively analysis by means of a Bragg spectrometer (C). The latter employs a crystal of known atomic lattice spacing to diffract X-rays of differing wavelengths into different angles, in direct analogy to the formation of a spectrum from visible light by a glass prism.